America's two great pastimes—snacking and baseball—come together in one clever design. America's two great pastimes—snacking and baseball—come together in one clever design. Whether you're watching solo or in a small group, it's a fun way to snack all season long: Just fill the bat and ball with your favorites, like peanuts and pretzels, and settle in to watch the game. The bat is crafted from ash wood—the same material used to make most Major League bats—and the ball is made from recycled aluminum, with textured stitching that adds special detail. Wood bat server made in Dorset, Vermont. Recycled aluminum bowl cast in Mexico. Just fill the bat and ball with your favorites, like peanuts and pretzels, and settle in to watch the game. The bat is crafted from ash wood—the same material used to make most Major League bats—and the ball is made from recycled aluminum, with textured stitching that adds special detail. The Baseball Snack Server is packaged in a partially recycled and recyclable/compostable corrugated box, with partially recycled and recyclable/ compostable paper fill. 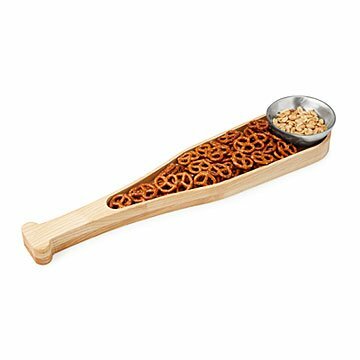 There's one place—and only one place—where you'll find the Baseball Snack Server: UncommonGoods. Used in family and friend gatherings, especially during the baseball season. I believe I paid too much for this item, although it is very nice. The price was in the sixty dollar range, and when everything was said and done, I paid over $100.00 for it.